Most of the time, I end up cringing when I read the list of ingredients in prepared and/or processed foods - sometimes even the "healthy" and organic ones. But as much as I love to cook, it's just not feasible for me to make everything from scratch all the time. Plus, I still haven't developed a taste for all of the foods I *should* be eating (white rice is still a staple in my life). I've shied away from using totally 100% whole grain breads for sandwiches because I find them a little too dry and dense. But for some toast to go with a little butter and my a.m. coffee, this bread is perfect. If you're looking for a little extra protein, you could spread it with peanut butter or cream cheese. I also think it would taste delicious made into french toast. Since this bread isn't filled with preservatives like normal breads, I keep it in the freezer and just pull off a slice and pop it in the toaster without even thawing it out first...it works great! I know that Ezekiel breads might not be available everywhere, but probably just about any grocery store will have a form of 100% whole grain cinnamon raisin bread. Mainstream stores usually have a "natural foods" section that carries different breads than you'd find in the typical bread aisle. This bread is also often sold frozen since it doesn't have the shelf-life of other breads. The Food for Life website has a "where to buy" feature where you can type in a zip code and find any local retailers near you. You can access their website by clicking here. Ezekiel breads are fabulous. Haven't had this particular bread, yet, but you can be sure I'll put it on my shopping list. Keeping it in the freezer is a brilliant idea. 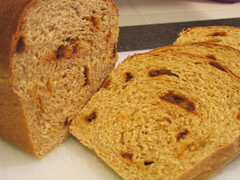 I love cinnamon raisin bread. I just don't really eat any breads anymore, though.